The New Richmond Board of Education has been presented with a K-12 English Language Arts course of study for the 2013-14 school year that completes a two-year project by the district to meet the new Common Core State Standards in math, reading and writing recently adopted by the State of Ohio. The school board is expected to vote on the adoption of the K-12 English Language Arts initiative at its May 20 meeting. 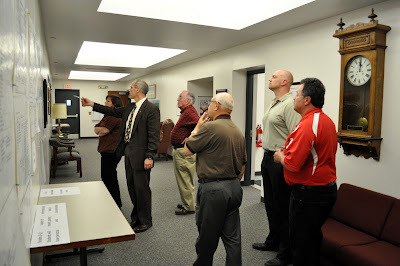 Board members received a detailed presentation of the project from Supt. Adam Bird during their April 15 meeting. New Richmond superintendent Adam Bird briefs school board members (from left) Kim Hayden, Fred Heflin, Ben Bird, Kevin Walriven and David Hawkins on the district’s a K-12 English Language Arts course of study designed to meet the Common Core Standards for reading. “This language arts initiative is the result of more than a year of planning with a steering committee and grade level teams evaluating our current practices and the proposed Common Core State Standards,” explained John Frye, director of Staff and Pupil Services for the New Richmond Exempted Village School District. 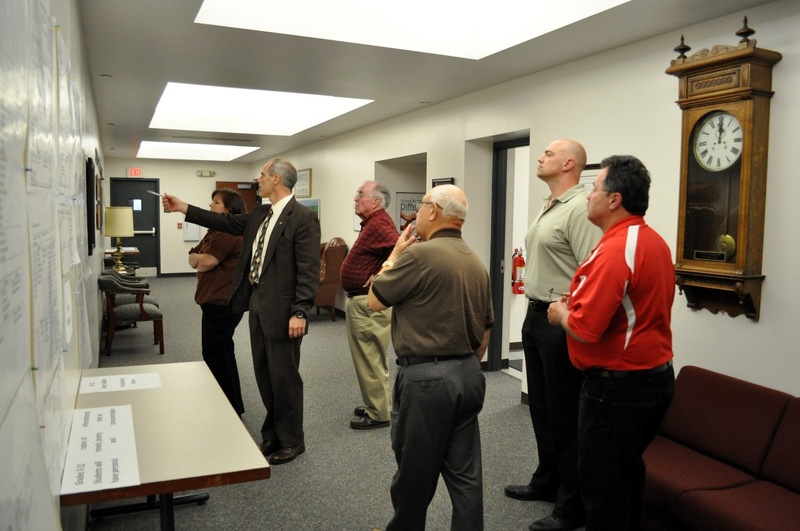 Examples of the project are on display in the New Richmond Board of Education Office on the third floor of the Market Street building in New Richmond. (212 Market Street, NRO 45157). Residents are welcome to browse the presentation which includes all reading materials for grades K-12, including 180 read aloud books for the district’s Kindergarten classes. Frye noted that the Common Core goals are internationally bench marked and emulate expectations found in high performing systems abroad, but do not call for a specific curriculum or reading list. “Rather, they lay out an ambitious set of goals for the math, reading and writing skills that children should acquire as they move through school,” Frye said. By fifth grade, for example, students will be required to produce essays in which they introduce, support and defend arguments, using specific facts and details. By 12th grade, they will be asked to solve problems and answer questions by conducting focused research projects — using skills that are generally associated today with the first year of college. The standards are flexible so that states and localities can implement them in varying ways and New Richmond’s implementation is designed to zero in on a rich, reading experience for New Richmond students as well as preparing the district to meet Ohio’s Third Grade Reading Guarantee. “It’s important that we have alignment at the elementary level and agreement on common reading materials so students coming into middle school from our three elementary schools all have the same background, all have the same experiences having read the same books,” said Frye. The language arts initiative follows new math programs adopted by the district to align the district’s three elementary schools with the Common Core math standards.